How to get there: The normal approach is by a ski equipped Twin Otter airplane directly from the small town Isafjordur on Iceland. See my Greenland pages for more extensive information. Route description: From the normal Hvitserk base camp location, the first part of the route is the same as to Hvitserk, ski the long uphill glacier going west. Higher up, when you see the col between Hvitserk (right) and the rounded Point 3535 summit to your left, head for the level area just right of Point 3535. This is not the lowest col, but a bit further south. From this point ski down onto the glacier between Point 3535 and the nicely shaped mountain Cone (3rd. highest in Greenland). Beware of possible crevasses in the upper part of this slope. Cross the more level glacier further down and aim for the very distinct ridge of Cone that forms the western edge of the glacier. This ridge can be climbed on skis without any problems just where its slope from Cone levels off. Do an ascending traverse to your right in order to reach the ridgeline. Again, beware of possible crevasses in this area. 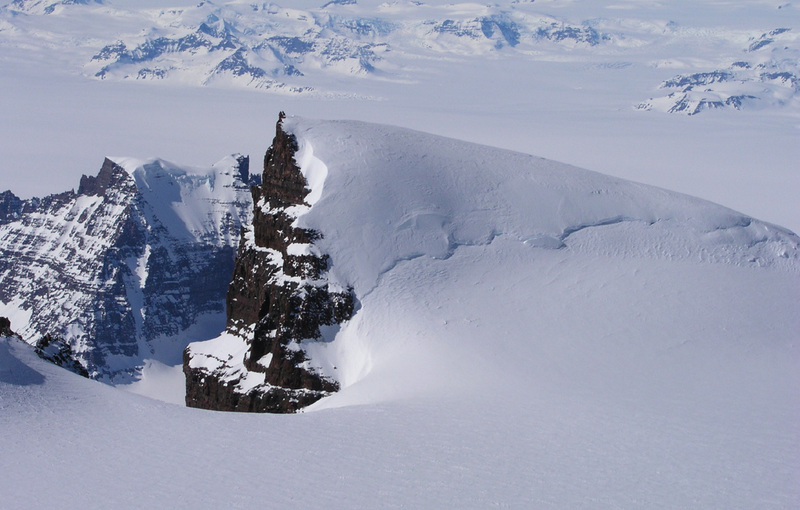 You are now on an elegant, high glacier north of Cone that extends across to Styggehorn. Ski across and aim for the right (north) end of the ridge descending from Styggehorn. Once on this ridge, either continue on foot or ski up the ridge to the two characteristic rock horns at the summit. The ridge narrows the last 30 meters, be extremely careful with respect to cornices and the monumental drop on your west side. The difficulty of this route never exceeds (YDS) class 2. Comments: I did this climb together with Ståle Grimen. 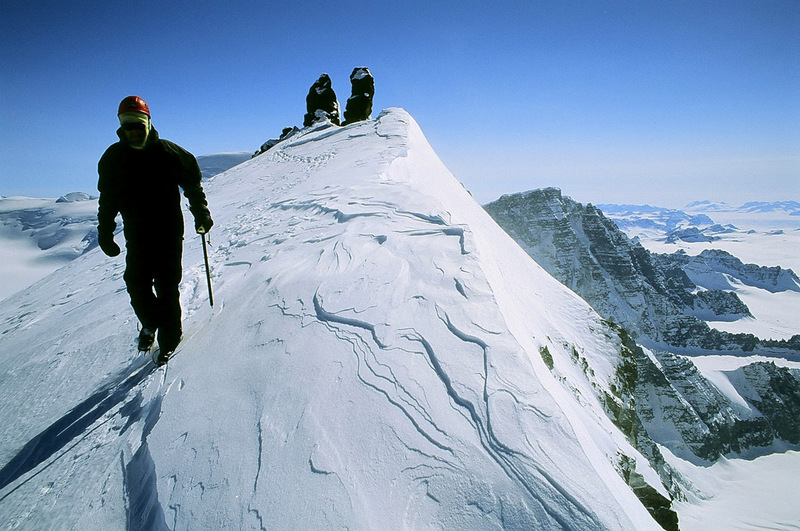 The climb was a first ascent, most likely of the highest unclimbed mountain in Greenland. This is quite a long round trip from the Hvitserk base camp area. A full day should be anticipated. Note that the Hvitserk map states an elevation of 3603 meter, while the correct height is 3503 meter. By exploring this route, it also became clear that one can traverse from Hvitserk to the west side of Cone (and therefore further along to Dome) along this high route. The Styggehorn summit, as seen from the summit of Cone. The Styggehorn summit, I am on my way down, the vertical on two sides was quite sensational.